Two New York lawmakers say that a coin being marketed as a "tribute" to 9-11 is a scam and an "all-time low" for the for-profit private company making the coins. 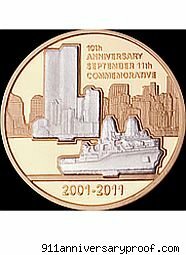 Senator Charles Schumer and U.S. Rep. Jerrold Nadler have complained to both the Federal Trade Commission and the U.S. Mint about the coins, which show a skyline featuring the Twin Towers and a Navy ship.The coin, which Consumer Ally wrote about last week, is made by National Collector's Mint, a Westchester, N.Y., company that has no connection to the U.S. Mint. According to its website, the piece sells for $29.95 and allegedly includes "silver actually recovered from the vaults beneath the ashes of Ground Zero." It states the the coin is "Liberian government authorized legal tender." Schumer and Nadler, both New York Democrats, want the FTC to shut down production of the coin. They proposed a bill last summer that would create an official 9-11 medal, and the proceeds would support the National Sept. 11 Memorial & Museum at the World Trade Center site. They say the National Collector's pieces will take money away from the memorial and have asked the U.S. Mint to put a notice on its website warning consumers about the coins. "We are calling on the FTC to crack down on this unscrupulous company and send a loud message that profiteering off a national tragedy will not be tolerated," Schumer said. This is not the first time the National Collector's Mint has been accused of shady practices. Coin experts generally say the pieces are not collector's items and will not increase in value over time. They point out that the 14 mg of gold promoted in making the item are actually worth about 64 cents. In 2004, the company had to pay more than $2 million in penalties and refunds after it was found to use "deceptive advertising" to sell a World Trade Center commemorative "Freedom Tower Silver Dollar." Then Attorney General Elliot Spitzer ordered it to stop producing the coins. A judge ruled that the company was guilty of fraud. But Schumer said the company still made $11 million off the "silver tower" coins, although they were believed to be worth about 2 cents each. Last week, National Collector's Mint President Avram C. Freedberg defended his products and his company. He said that the company has given more than $2 million to 9-11 charities and that the media does not focus enough on that aspect.